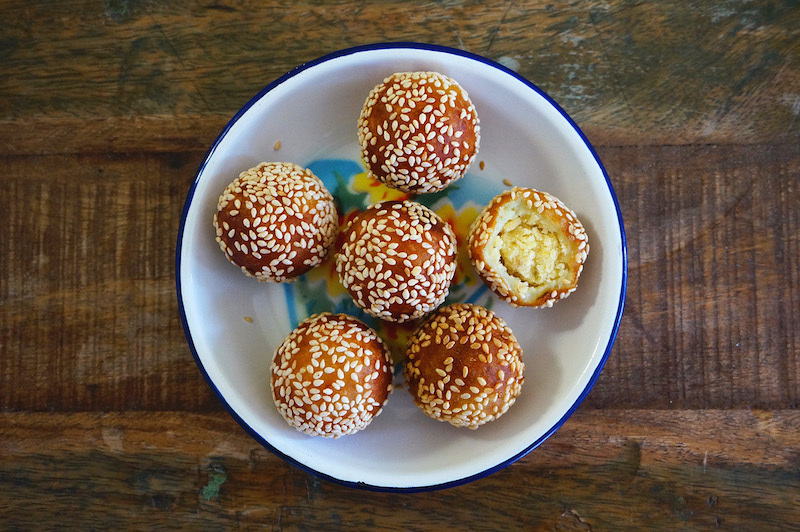 Fried Sweet Potato Balls are a popular sweet snack throughout South East Asia. It’s also known as Onde-Onde in Indonesia, Kanom Kai Nok Krata in Thailand, Bánh Cam in Vietnam, etc. The recipe varies from different countries, some filled with red bean paste, ground peanuts, or as it is. Make the Mung Bean Filling: Soak the dried mung beans for 2 hours, rinsed well and place in a steamer lined with cloth. Bring the water to a boil on high heat and steam for about 20 minutes, or until soft. Then transfer the soften mung beans to a wok or pan. Add sugar and keep stirring until dry and the sugar dissolved. When cool, divide the mung bean paste into 40 portions and shape into small balls. Make the Sweet Potato Balls: Flatten a portion of the dough into a disc, place the mung bean paste in the centre, and roll them in your palm to form a smooth ball. Then roll it in sesame seeds. Repeat the remainder ingredients. Heat the oil in a deep fryer or heavy pan over low to moderate heat. Put in a cube of potato – when potato is nicely colored, the oil is hot enough to fry the sweet potato balls. Fry until golden brown, remove and drain on a paper towel. Serve warm.